George Engleheart was one of the most significant portrait miniature painters of the late eighteenth century and his vivid portrayals of society’s elite perfectly define the elegance and romanticism of the Georgian era. Engleheart’s initial training came from the unlikely coupling with the Irish-born landscape painter George Barret (c.1730-1787), and later with the more fitting, and evidentially impressionable, Sir Joshua Reynolds (1723-1792). Engleheart entered the R.A schools in 1769 and by 1773 had exhibited his first work. Engleheart enjoyed a prosperous career, exhibiting some eighty-five portrait miniatures at the R.A until 1822, his account books recording up to thirty sittings on some days. 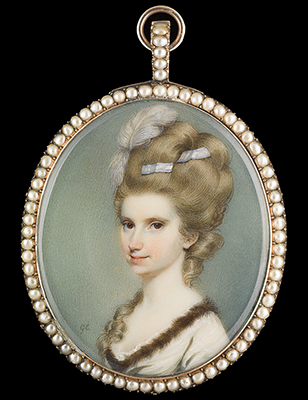 By the time Engleheart established his own practice c.1773 the market for portrait miniatures had rapidly expanded and whereas in the early eighteenth century those who painted miniatures rarely acknowledged this as their speciality, by 1763 there were numerous artists advertising specialisation in this field. Engleheart surrounded himself with like-minded, educated individuals, including artists and poets. His close circle of friends included William Hayley, George Romney, William Blake, John Flaxman, and Jeremiah Meyer. Engleheart attracted wealthy and important clientele and by 1776 had already painted George III several times (he would paint the king over twenty-five times during his career). In 1789, on the death of Jeremiah Meyer, he was officially appointed miniature painter to the king.